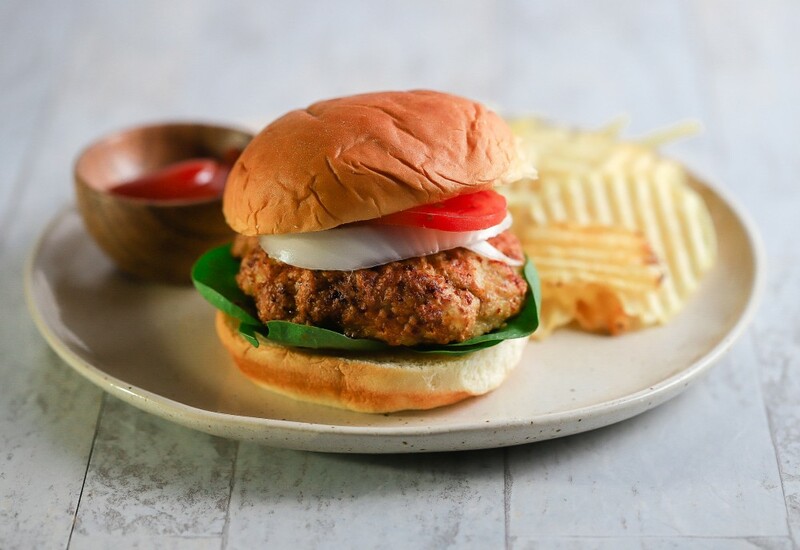 Chicken burgers made in air fryer are perfectly juicy and tender with every bite. Ground chicken, bread crumbs, Parmesan cheese, and garlic come together creating a lighter version of a traditional beef burger. Ready in about 45 minutes, these burgers will be a crowd-pleaser in your house. Serve on a bun with your toppings. Try ground pork or ground turkey in place of the ground chicken. Use gluten-free bread crumbs and gluten-free Worcestershire sauce for a gluten-free version of this burger. Per Serving: 318 calories; 16g fat; 12.1g carbohydrates; 32g protein; 173mg cholesterol; 419mg sodium.